Herod was king of Judea from around 40 B.C. to 1 B.C. It was during this time that a Jewish priest named Zacharias and his wife, Elizabeth, had a child. What made this birth special was the fact that both Zacharias and Elizabeth were very old. This child was Elizabeth’s first. What made this birth even more extraordinary was the fact that the birth was foretold to Zacharias, by an angel of the Lord, Gabriel. The angel not only foretold the birth of John the Baptist, he also prophesied that John was going to be the forerunner to the Messiah in the spirit and power of the ancient prophet Elijah. When Elizabeth was six months pregnant with John, the angel Gabriel was sent from God to Nazareth, a city in Galilee. Gabriel visited a virgin who was engaged to be married to a man named Joseph. The virgin’s name was Mary. You are highly favored, the Lord is with you. But Mary was greatly troubled by this greeting, and wondered what it meant. The angel told her not to fear and repeated that she had found favor with God. Then Gabriel told Mary that she would conceive a son and that she was to call his name Jesus. He shall be great, and shall be called the son of the most high. And the Lord God shall give unto him the throne of his father David. And he shall reign over the house of Jacob and of his kingdom there shall be no end. How shall this be, seeing I have never had a physical relationship with a man? The Holy Spirit will come upon you, and the power of the most high will overshadow you, and the holy thing which is begotten shall be called the son of God. And take notice: Elizabeth your cousin, has also conceived a son in her old age and is now six months pregnant. No word from God shall be proclaimed without power. Behold, the handmaid of the Lord; let it happen to me according to your word. A week later, Mary went hurriedly to the hill country, into a city in Judea. She went into the house of Zacharias and greeted Elizabeth. When Elizabeth heard Mary’s greeting, the baby inside her leaped in her womb and Elizabeth was filled with the Holy Spirit. Blessed are you among women, and blessed is the fruit of your womb. Why am I so honored that the mother of my Lord should visit me? Mary then began to magnify the Lord and to rejoice in God her savior. Mary stayed with her cousin Elizabeth for three months. When Elizabeth’s time came she delivered a boy and they called him John, as the angel had directed. John’s father had been struck dumb by the angel Gabriel because he had doubted the message regarding the birth of John. Once John was born his tongue was loosed and he blessed God and was filled with the Holy Spirit. Blessed be the Lord, the God of Israel; for he has come back to redeem his people. And he has raised up a horn of salvation for us in the house of his servant David. And this child will be called a prophet of the most high; he will go before the face of the Lord and make ready his ways, to give the knowledge of salvation to his people, to shine upon those that sit in darkness. John grew up and became strong in spirit. He lived in the desert until the day his ministry began, which was when he began to declare that the Messiah was coming. The birth of Jesus Christ came about in this way. His mother, Mary, was engaged to Joseph. Before their marriage was consummated by having physical relations, Mary was found to be with child from the Holy Spirit. Joseph, being the kind of man who would not stain his family name, but also not wanting to put Mary to shame in public, had decided to divorce her as quietly as he could. While Joseph was thinking about the best way to do this, he was visited by an angel of the Lord in a dream. Joseph, son of David, don’t be afraid to take Mary as your wife, for that which is conceived in her is of the Holy Spirit. Mary will have a son and you will call his name Jesus, the one we have been waiting for to save his people from their sins. Behold, a virgin shall be with child and she will have a son and they will call him Immanuel, which means, God with us. Joseph woke up from his sleep and did as the angel of the Lord commanded him. He took Mary as his wife but he had no physical relations with her until after Jesus was born. It was during this time that a decree was sent out from the Roman emperor Caesar Augustus that there should be a census for the entire world. People were told to return to their cities. Mary and Joseph went up from Galilee out of Nazareth, the city of David’s family. Mary was ready to give birth, which she did in Bethlehem. Mary delivered her first-born son and wrapped the baby Jesus up in swaddling clothes and laid him in a manger because there was no room for them in the inn. Nearby there were shepherds in the fields who were working the night shift over their flocks. An angel of the Lord stood by them, and the glory of the Lord shone all around them. Don’t be afraid; for behold, I bring you good tidings of great joy which will be to all the people. For today, in the city of David, a savior, who is Christ the Lord, has been born. And this will be the sign: you will find the babe wrapped in swaddling clothes and lying in a manger. Suddenly, there appeared a host of angels, all praising God and saying, Glory to God in the highest, and on earth peace among men in whom he is well pleased. Let’s go to Bethlehem right now and see this thing that has happened, which the Lord has made known to us. They immediately went and found Mary, Joseph and the baby lying in the manger. When they saw the baby Jesus, they made known what had been told about the child. Everyone who heard it wondered about the things the shepherds reported. But Mary kept all these sayings to herself, pondering them in her heart. Then the shepherds returned to their fields, glorifying and praising God for all the things that they had heard and seen. After eight days, having fulfilled the rite of circumcising the child and officially naming him Jesus, and after all the ceremonial laws concerning purification was complete; they brought Jesus to Jerusalem to present him to the Lord. This was all done according to the law of the Lord written by Moses. There was a man in Jerusalem, whose name was Simeon. He was a righteous and devout man who was looking for the era of the Messiah to be ushered in. The Holy Spirit was upon him and had revealed to him that he would not die until he had seen the long awaited Messiah, the Lord’s Christ. Simeon had been inspired by the Spirit to go into the temple at the same time Joseph and Mary brought their child into the temple in order to perform all the customs and duties that the law of Moses required. Now let your servant depart in peace Lord, according to your word. For I have seen with my own eyes your salvation, which you have prepared before the face of all peoples. A light of revelation to the Gentiles, and the glory of your people Israel. Joseph and Mary were marveling at the things that Simeon was saying about the child Jesus. Behold, this child is going to cause the falling and the rising of many in Israel and many will resist the truth. Yes, and for a sword that shall pierce through your own soul and the thoughts of many hearts may be revealed. At the ceremony was an old woman named Anna, a prophet of the tribe of Asher. Anna was devoted to the services of the temple and spent much of her time worshipping with fasting, praying both night and day. When she saw Jesus she spoke to him and gave thanks to God. She pointed Jesus out to all who were looking for the redemption of Jerusalem. When Jesus was born in Bethlehem, wise men from the east came to Jerusalem. 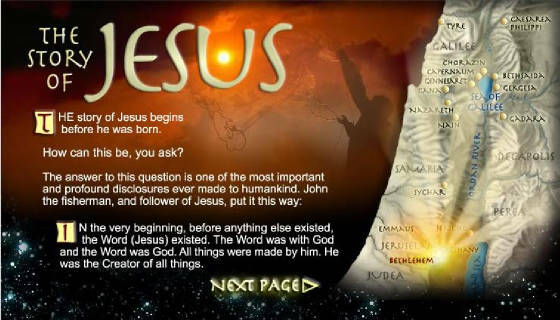 Where is the one that has been born king of the Jews? We have seen his star in the east and are come to worship him. When King Herod heard about this he was troubled, as was all Jerusalem. Herod gathered the chief priests and scribes of the people and asked them where the Christ would be born. And you Bethlehem, land of Judah, are by no means least among the rulers of Judah: For out of you shall come a governor, who shall be the shepherd of my people Israel. Herod privately called the wise men to learn the exact time the star appeared. Then he sent them to Bethlehem to go and find out all they could about the young child. He told them that when they found him they should bring all the information to him so that he could he could worship the child. The wise men listened to what Herod said and went their way. The star, which they saw in the east, went before them until it stood over where the young child was. When they saw that the star had guided them to the right spot, they rejoiced. The wise men came into the house that the star had directed them to, and saw the young child with Mary. They fell down and worshipped him and opened up their treasures and offered him gifts of gold and frankincense and myrrh. And being warned by God in a dream that they should not return to Herod, they returned to their own country by a different route. Get up and take the young child and his mother, and flee to Egypt. You will stay in Egypt until I tell you to return: Herod is going to search for the child in order to destroy him. Joseph got up and took the child and his mother to Egypt that night. They stayed in Egypt until the death of Herod. Out of Egypt did I call my son. When Herod realized that he had been mocked by the wise men, he went into a rage and sent out his soldiers to kill all the male children in Bethlehem and the surrounding area who were 2 years old or younger. A voice was heard in Ramah. Weeping and great mourning, Rachel weeping for her children. And she would not be comforted because they are no more. Get up and take the young child and his mother, and go into the land of Israel. The ones that wanted to take the young child’s life are dead. Joseph did as the Lord commanded, left Egypt and came back into the land of Israel. But when Joseph heard that Archelaus, the son of Herod, was ruling over Judea, he became afraid. And being warned by God in a dream, he withdrew from Judea and went to Galilee where he settled in Nazareth. This fulfilled the prophecy that said that the Messiah would be called a Nazarene. The child grew and increased in strength. He was filled with wisdom. The grace of God was upon him. Every year Joseph and Mary went to Jerusalem to celebrate the feast of the Passover. When Jesus was 12 years old he went up to Jerusalem with his parents to celebrate the custom of the feast. After the celebration, Mary and Joseph went home, thinking Jesus was in the crowd that was returning to Nazareth. But Jesus stayed behind in Jerusalem. One day passed and Jesus’ parents realized, after searching all over for Jesus, that he was not among them. They immediately returned to Jerusalem. After three days, they found him in the temple sitting in the midst of the teachers. Jesus was listening and asking questions. Everyone who heard Jesus was amazed at his understanding and his answers. Why have you treated us this way? Your father and I have been worried sick looking for you everywhere. How is it that you were looking for me? Didn’t you know that I must be in my Father’s house? Mary and Joseph did not understand what Jesus was saying to them. But they left together to return to Nazareth, as Jesus was subject to his parents. Jesus advanced in wisdom and stature, and in favor with God and men. Not much else is known about the life of Jesus until John the Baptist began his public ministry and Jesus bursts on the scene followed by signs, wonders and miracles.